PICASSO - What a wonderful male, direct son of The Rooster and Memories Maker!! The Rooster is one of the best breeding sons off The Phantom & Jasmine!! Memories Maker is a direct daughter of Phantom's Legend & Memories, making her a little more than a half sister to Mona Lisa!! 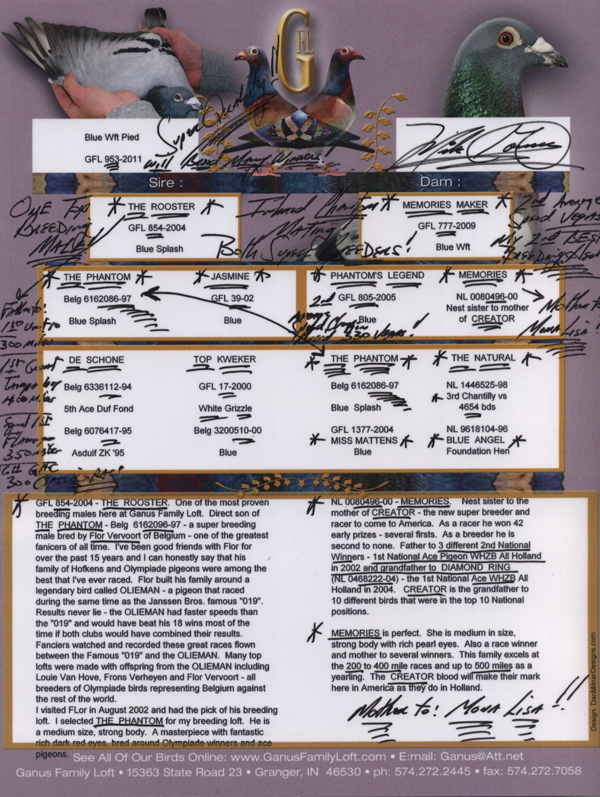 Mike calls Memories Maker his 2nd Best Breeding hen, only behind Mona Lisa!! Picasso is a tremendous handling male, small medium in size, a perfect well muscled breast, an exceptional rear end, single pin tail, with the tighest vents of any bird in my loft (Phantom was the tighest vented bird that I have ever handled)!! Picasso has a very reactive eye, one that he controls the dialation of the pupil, voluntarily constricting it down to a pen!! Just a masterpiece of a male!! 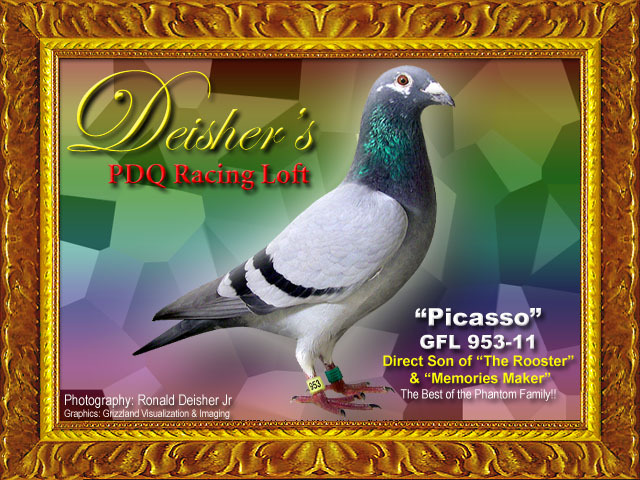 He will be mated to a double granddaughter of Phantom for stock birds in 2013 and to a double granddaughter of Mona Lisa for flying purposes!! I am looking forward to spectacular results!! Youngsters will normally be priced at $400, introductory prepaid orders will be booked for $300 each for all orders prepaid by December 15, 2012, this includes your shipping. There will be a limited number available from either double granddaughter, The Phantom double granddaughter or the Mona Lisa double granddaughter!! Please specify your request in your email to me, thank you Ron.